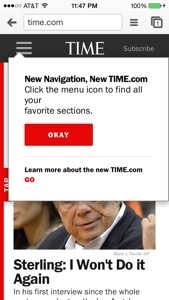 Last night I discovered that TIME Magazine had added an intro tour screen for the sole purpose of explaining how to use their hamburger icon. Their faucet was a hamburger icon navigation menu and their users just weren’t getting it. I doodled the sketch above and posted it on Twitter, and wound up having a great subsequent conversation around it with another designer. I surely do! 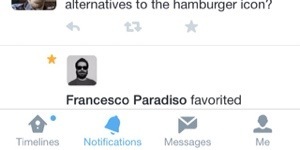 I’m a fan of the screen base icon bar. Toss in 3-4 icons and a “more” option, and you’ve got a clean easy to understand navigation structure. You do need to make sure that your icons are either very clear to your users in meaning, or labeled for this method to work well. The native iPhone Quora, Twitter, Pinterest and Facebook apps are all rocking this style at the moment. 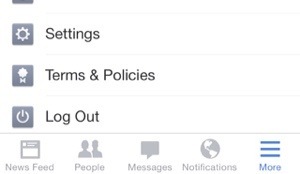 As you can see, Facebook even managed to cleanly pulled off a modified hamburger, by converting their hamburger icon to a “more” option. The next time you’re tempted to pop a hamburger icon in your app and call it a day, consider making a healthier more user friendly choice!